ATTENTION PET OWNERS: The AVMF does not provide funding to individuals in need of financial assistance or referrals to veterinarians enrolled in the program. All requests for financial assistance must come directly from a licensed AVMA member veterinarian. The Veterinary Care Charitable Fund® is a program created by the American Veterinary Medical Foundation (AVMF) to provide veterinarians with a simple and effective way to offer charitable veterinary services to clients facing personal hardships as well as a means to support animals who are injured or rescued from abuse and neglect. Enrolled veterinary hospitals now have a way to offer low or no-cost services to clients who may otherwise be forced to surrender or euthanize their beloved pets. 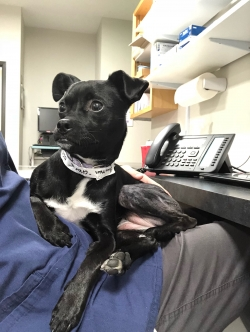 Charlie is a wonderful little 10-month-old terrier/chihuahua mix that had been getting progressively lame over the last month. The dog was taken to Pendleton Veterinary Clinic for evaluation and x-rays showed degeneration of the left hip. The owners were heartbroken because they could not afford the surgery at this time and knew that Charlie would have to live in pain. However, because Pendleton Veterinary Clinic is enrolled in the AVMF Veterinary Care Charitable Fund program, the hospital was able to use generous donations made to its fund to help Charlie’s owners cover the cost of treatment. Charlie is progressing well after his surgery and will be walking pain-free in the future! This dog, Hope, was struck by a car while her owners were out of town. When notified about the accident, the owners indicated that they could not afford to pay for treatment and asked for her to be euthanized. A rescue organization stepped in and took ownership of the dog and took her to Integrative Pet Care for emergency care. 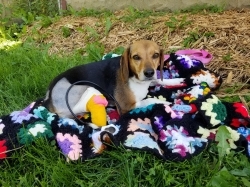 Hope’s leg was badly injured and despite the hospital’s best efforts to save it, she ultimately needed to have a right rear amputation and left femoral head osteotomy (removal of the “ball” part of the ball-and-socket that makes up the hip joint). Because Integrated Pet Care is part of the AVMF Veterinary Care Charitable Fund, the hospital was able to use funds from their account to help alleviate some of the rescue organization’s financial burden for the initial cost of treatment. We’re pleased to report that the rescue organization is continuing to provide follow-up care and is looking to fit her with a prosthetic. The Scottsdale Sheriff's Department was called to investigate a downed foal. Upon arrival, the detective noticed that the foal had abrasions to face and body, was in obvious pain, passing diarrhea, and not nursing. The owner asked to euthanize the foal, but the detective suggested that the owner relinquish ownership to the Arizona Equine Rescue Organization instead. The rescue organization took the horse to Chaparral Veterinary Medical Center for treatment. Because Chaparral participates in the AVMF Veterinary Care Charitable Fund®, donations were available to help pay for medical care for this needy animal. The horse, now renamed “Sheriff,” has a new home, is healthy, and is being trained to be an eventing horse. 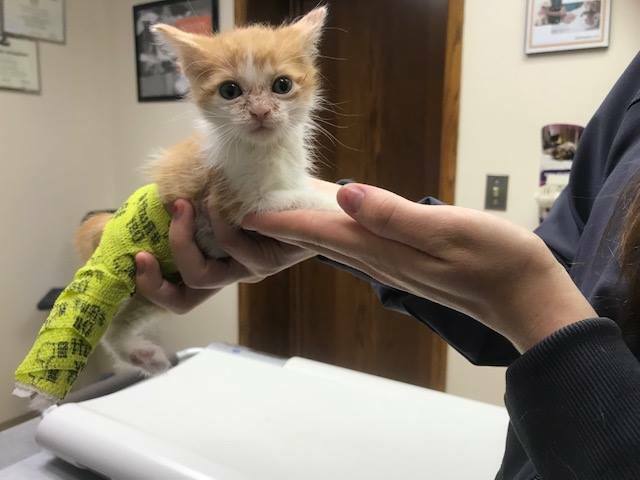 This sweet little kitten, Hiss, was found in the middle of a highway with a broken leg! His rescuer took him to Dodgeville Veterinary Service right away for treatment. Dr. Ebbe was able to splint the kitten's leg and now Hiss is being nursed back to health by his rescuer. Thanks to generous donors to the AVMF Veterinary Care Charitable Fund®, Hiss will soon be adopted by his rescuer once he is healed and healthy. 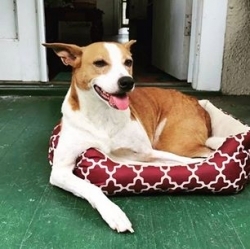 The following story of Ember, a lovable mixed breed dog, is just one example of the hundreds of animals that have received care through the AVMF Veterinary Care Charitable Fund®. Ember was a victim of animal abuse. She was found after she was nearly killed when someone tied her to a rope then dragged her behind a moving vehicle. Large areas of her skin were ripped from her legs and she suffered wounds to her chest and face. Thanks to generous donors to the AVMF Veterinary Care Charitable Fund® and Dr. Behrns of Crestone Mobile Veterinary Service, Ember was provided treatment and has completely healed from her wounds. She is now living happily with Kai, her new owner. Jessica and her feline sibling, Oke, were trapped in a house fire. Through the owner's quick action, and the help of the New Orleans Fire Department, the animals were rushed to Prytania Veterinary Hospital. Staff was able to quickly and effectively treat both pets who were suffering from smoke inhalation. Over the course of two months, the practice provided veterinary care, both hospitalized and outpatient, to Jessica and Oke. Treatment expenses were paid through the AVMF Veterinary Care Charitable Fund®, a program that helps animals who are injured, rescued from abuse and neglect, and the pets of clients facing personal hardships. We’re pleased to report that both pets have made a full recovery! Local police were called to a school where a young student found a cold and nearly unresponsive kitten. Police referred the kitten to Animal Control, who brought it to Huron Veterinary Hospital. The hospital was enrolled with the AVMF Veterinary Care Charitable Fund®, a program which helps support veterinarians with the charitable services they provide to animals in their community. Luckily, the kitten (now named Thor) responded well and went to a foster home to recover, before returning to the hospital to be neutered, vaccinated, and then adopted by a clinician at the very same school where he had been found! Prince the puppy was breached in the birth canal; as a result, his back legs were paralyzed and he was unable to control his bladder or bowels. Upon providing initial treatment, Dr. Mitsie Vargas of Orchid Springs Animal Hospital encouraged Prince's owners to return with him. Unfortunately, after two weeks, they had not returned. They later informed her that it was because they were unable to afford the full care Prince needed. Knowing that the puppy could recover with aggressive treatment, Dr. Vargas informed the family that Orchid Springs could help with payment by using donations received through the AVMF Veterinary Care Charitable Fund®. Today, Prince is standing and walking! He has joined many other animals with a second chance at life. The American Veterinary Medical Foundation (AVMF) is the charitable arm of the American Veterinary Medical Association (AVMA), one of the oldest and largest veterinary medical organizations in the world. More than 91,000 member veterinarians worldwide are engaged in a wide variety of professional activities. For more than 50 years, the Foundation has been helping veterinarians help animals with support for education, research, animal welfare and disaster relief activities.